The trial heard that their victims were often homeless drifters or addicts, who were forced to live in squalid caravans. 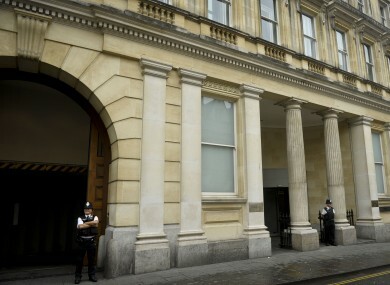 File photo of Bristol Crown Court. FIVE MEMBERS OF an Irish Traveller family were found guilty by an English court today of forcing destitute men into servitude. William Connors, 52, his wife Mary, 48, their sons John, 29, and James, 20, and their son-in-law Miles Connors, 24, were all convicted of conspiracy to require a person to perform forced or compulsory labour between April 2010 and March 2011. The trial heard that their victims were often homeless drifters or addicts, who were forced to live in squalid caravans on Traveller sites where they were controlled by violence. Some worked for the family for nearly two decades. A jury at Bristol Crown Court in southwest England found the Connors family guilty following a three-month trial. They are due to be sentenced on Monday. Comments on this story have been disabled as court proceedings are ongoing. Email “Irish Traveller family found guilty of 'slavery'‎ ”. Feedback on “Irish Traveller family found guilty of 'slavery'‎ ”.